This story starts in a west end Halifax toilet bowl, seven nights before Halloween. The husband goes to check it out. But all the doors are locked and nothing is amiss. The banging stops. He goes back to bed. The wife sleeps through the whole thing. Do you know where I’m going with this? I think you probably saw the image on these pages and you know where I’m going with this, right? OK. I just want to make sure. “There was no screaming or shrieking. He handled it very diplomatically,” says Elaine Hart re-telling this, her rat chronicle. Rats are “not very good swimmers,” according to Andrew Hebda, curator of zoology at the Nova Scotia Museum of Natural History. The 1973 hour-long National Film Board documentary Ratopolis (gruesome! bloody! recommended!) is a dose more definitive. And once he’s in the toilet bowl? “The endurance of rats in water has been tested at amazing lengths.” They can tread water for up to 80 hours. Now do you want the bad news? Adam Beaver has worked with Bremner’s Plumbing for 15 years. He “can count on one hand” the number of times he’s been called to install a backwater valve---a regulator that costs $600 to $1,000 to install. Backwater valves prevent sewage from backing up into houses; they also stop rats from swimming up to say hello. But “since late spring,” Beaver says, “we’ve done probably seven or eight installations for that reason alone.” His most recent rat consultation was last week near Robie and Cunard. You’ve probably got a rat story, right? Just like that guy next to you, and your grandmother, and your doctor---the pear-shaped one struggling to squeeze through the sewer grate on the Brunswick Street side of the Spring Garden Library; accidentally vacuuming one up in the spare room behind a bookcase and yanking it out of the clogged hose thinking it was a dirty sock; having your child step on the already-dead variety outside the Dalhousie Dentistry building during the 2007 Holiday Parade of Lights. Know why everyone’s got a rat story? Because rats are everywhere. Or, at least, everywhere there are humans. S. Anthony Barnett, in his 2001 book The Story of Rats, chills readers with reference to 55 diseases (“a certainly incomplete list”) carried by rodents. But can’t humans be accused of the same crime? Really, rats are more like us than we would probably like to admit. Like us, they are omnivorous. And, like us, they mostly prefer densely populated areas with large artificial structures. And, again like us, they exhibit cracker-jack resilience and adaptability to new environments. Rats are even smart---or, at least, they are neophilic, as the term goes. They welcome novelty. In experiments, rats will learn to repeatedly turn on a light. It’s not because they can’t see well enough (though, in fact, their eyesight is Mister Magoo-terrible; it’s balanced by their heightened senses of smell, taste, hearing and touch). After some days, it’s as if the rats get bored---they’ll start working to keep the lights turned off. In other experiments, rats will figure out how to push levers to produce noise. Dropped into a new environment, their first task is exploration, even if they haven’t eaten for some time and there is food for the taking. And their social structure mirrors our own. They congregate in colonies and set up hierarchies. Unlike wolves, there is usually no one rat leader. The Alphas comprise the highest stratum. Second-class Beta rats are tolerated, so long as they defer to the strength of the Alphas. Omegas make up the rest---they are shunned and live on the colony’s outcroppings. Next time you’re at the Museum of Natural History on Summer Street, look up. Two floors above Gus the tortoise and the museum gift shop sit half a million catalogued specimens. The collections floor is nearly refrigerator-cold, with wafts of moth balls and Vapona strips. 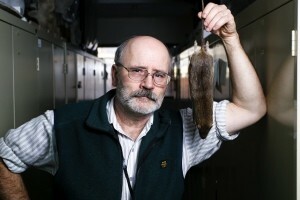 It’s been the lair of avuncular-yet-fast-moving curator of zoology Andrew Hebda for 13 years. “I may get two or three calls a week this time of year about rats,” he says. The curator rockets over to a cabinet filled with herbarium sheets---flattened flora, basically. In another spot: brain coral. Around the corner is the “wet” collection---gooey beasties submerged in jars of what looks like left-over pickled-egg brine. In the opposite corner are rice- to tennis ball-sized insect and arachnid specimens. Tucked in the middle of this dead animal wonderland is the “Rodentia” cabinet. Hebda slides out a drawer. I’m eye to eye with half a dozen stiff rats. These are study skins, flattened versions that can be easily stored in the drawers of the museum’s fire-proof metal cabinets. With study skins, animals’ insides, eyes and mouths are removed and replaced with cotton; the evicted skeletons accompany the skins. In this case, other skeletal bits are there, too. These are Norway rats, AKA, Rattus norvegicus. And that’s the kind we have here in Halifax---a European import, just like our mice. Norways are the big, burly kind---capable of growing 20 inches tip-to-tail. The cliche “a rat as big as a cat” fits here. But I like to picture it this way---20 inches is the average length of a newborn baby. Black rats, or Rattus rattus, which were carriers of the bubonic plague that wiped out one quarter of the population of Europe and England in the 1300s, are smaller by about six inches on average. Which, I suppose, could be construed as a comforting characteristic. Black rats appeared in Halifax first around 1850 and later disappeared. They made a comeback starting in 1996 that lasted for only two years. Why the failure to flourish? Norways are bigger and stronger and refuse to mate with them. They are surprisingly downy. “Yep, well, fur is fur is fur is fur,” Hebda says. There’s nothing to be gleaned from the sites these rats were found other than a hint at their geographical ubiquitousness. One specimen, tagged in 1961, reads City of Halifax Dump. “So that one happens to be Africville,” says Hebda. Its neighbour, a 1973 vintage, is from Forest Road in Dartmouth. See, rats are truly equalizing forces. They don’t care where they live, so long as there’s food. They can burrow through concrete, and chew glass and metal. A Young Avenue mansion is no more formidable a fortress than a north Dartmouth public housing low-rise. But where do they like to live? Halifax’s rats started arriving by boat along with the first Europeans. “Almost all ships in the 19th century have cats aboard, and they don’t necessarily have them there for companionship. They are there specifically to deal with rats,” says Dan Conlin, curator of marine history at the Maritime Museum of the Atlantic on Lower Water Street. Conlin says he’s seen rat stories dozens of times in sailors’ biographies and accounts. Today, rats are still easy cargo. Next time you’re near the harbour, take a look at a docked ship and you might see a tire-sized disc halfway down its mooring line. It’s an excluder---to stop rats from climbing the lines. Of course, we’ve already talked about their swimming abilities, so you can see the problem there. OK, so they come by boat. No surprise there. But then many stay on the waterfront. And it’s not because they like water, or that there’s more food down there. “If you go down Sackville Street, it’s quite a steep slope and then bang, you hit Lower Water Street and it’s very flat, right?” asks Andrew Hebda. Well that’s because it’s fill. Halifax Harbour shorelines were originally all muddy beach lands. Today the edges are flat and vertical because they have been backfilled. “Anywhere you put in coarse rubble it puts in spaces and cracks that they can move through for protection,” says Hebda. And where else is there a similar kind of loose ground? “OK, go up Coburg Road. What’s the first residence? Howe Hall? You know where the heating plant is in that area? Well the heating plant is the site of the old municipal dump. So, organic matter is not an issue, because that will break down with time, but dumps tend not to be well-compacted so you tend to have lots of spaces there. I staked out the crest of Coburg for this story but didn’t see any scurrying. Then again, Hebda said summer and this is December. They’re all staying warm in basements. “How can one make a census of small, nocturnal, well-camouflaged, burrowing animals?” wonders S. Anthony Barnett in The Story of Rats. In Halifax, as far as Andrew Hebda knows, no one’s done a count. But there is an estimate: 75 rats per block. That’s the standard ballpark, Hebda says, for urban areas on North America’s eastern seaboard. That’s a roughly constant population, Hebda says. People just notice them more when they move seasonally---like into houses when the frost hits---or when they have to shuffle off to Buffalo because their habitat is disturbed by, say, construction. Hebda says Harbour Solutions has displaced many a Halifax rat. Plumber Adam Beaver says he doesn’t know why his company has dealt with more holy-crackers-there’s-a-rat-in-my-toilet! complaints over the past six months than in the last 15 years combined but, he says, they’ve got some good guesses. Susheel Arora thinks that’s bunk. Arora is the Halifax Regional Water Commission’s manager of wastewater services. He knows construction displaces rats. “Where I live? Penhorn Mall is all torn up right now. And there are tons of rats around there. Because of the construction.” But he doesn’t buy that Harbour Solutions is driving rats all the way up people’s toilets. Before urban chickens, Haligonians routinely pointed the finger at municipal green bin composters, which have been blamed for providing food for the rats. Before that? It was the lack of municipal composting. So one day, you find a rat in your toilet. Heck, let’s imagine it’s not even that distressing. Let’s say you find a rat, just, say, in your house. There are three routes on the road to rodent elimination---pay an exterminator, DIY or call the city, like Gloria McCluskey did. Yes, that Gloria McCluskey, councillor for Dartmouth Centre and former mayor of Dartmouth. The Dartmouth rat community might. McCluskey grabbed her “fancy toilet plunger with a big pink flamingo on the handle,” and hopped in the car to her daughter’s Crichton Park split-level. These days it’s the same deal. HRM rat control isn’t preventive; it’s complaint-based. “It helps keep the cost down,” says Halifax Downtown councillor Dawn Sloane. Hart wasn’t going to just cross her fingers and keep a blue-and-white Coleman cooler on her basement toilet forever. She hired a plumber to install one of the backwater valves Bremner’s Adam Beaver has installed an unprecedented number of this year. Gloria McCluskey has also had the opportunity to take the DIY approach to rat control. If in a different form. “When we were first married we bought an older home in downtown Dartmouth. And we were in bed one night and I felt something crawling across my face.” McCluskey tickles her pinky-brown nail-polished fingers over her blond bangs. The next day, McCluskey marched herself over to Walker’s Hardware on Portland Street and procured some Common Sense Rat Poison. 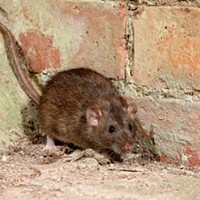 McCluskey says there’s no “real rat problem” in Dartmouth. And based on her anecdotal numbers, that sounds about right. When she was mayor she remembers there were rats in toilets on Limardo Drive and Chappell Street. As councillor, she has had to deal with rats in people’s garbage on Regent Drive, near Penhorn Mall. Lately, on the rat front, she hasn’t heard a squeak. John Zinck? Not so much. Zinck is Nova Scotia branch manager for Orkin Pest Control. He’s been in the rat biz for 15 years and has known many. Orkin is one of 13 pest control companies listed in the Yellow Pages. You can do that math however you like. “I have come across cases of mice where they have lived for six months inside a La-Z-Boy chair where the occupant snacks in the chair and is leaving enough food behind that the mouse is happy to come up, eat the food and go back in.” The population expands, Zinck says, before the humans really notice the problem. Rats, he adds, are easier to trap and easier to poison. And yet people are so much more horrified by them than mice. But there’s more to it than size. Rats infest our food, spoiling grain stores with their droppings, which, in case you’re wondering, look like brown Contac-C cold caplets. Norways eat one-tenth of their weight in food a day---for an average-sized one-pounder that’s 36 pounds a year. And Norways carry disease---leptospirosis, Yersinia pestis (that’s plague), Lassa fever...you know what? Let’s not go any further. The other thing about rats? They are just so damn robust. Norways can climb four to five metres, hang with their semi-prehensile tails and employ their collapsible skeletons to squeeze through holes three-quarters of an inch in width. I just dug through the change in my sweatshirt pocket and measured. That’s the diameter of a nickel. Their average lifespan is eight to 11 months, but Norway rats breed like, well, you know what? Not even like rabbits. Like rats. Someone should change that cliche. Interestingly, wide-scale poison assaults to decrease populations usually fail, according to Robert Sullivan in his 2004 book, Rats (for which the author spent a year in a forgotten New York alley to observe wild urban rats in their natural habitat). “When rats are killed off,” writes Sullivan, citing a 1950 report by American rat researcher and “founding father of modern rat studies” David E. Davis, “the pregnancy rates of the surviving rats doubles and the survivors rapidly gain weight.” It’s killing rats just to make room for stronger rats. Even under normal circumstances, a single pair of Norway rats, if all their young survived, could produce 20 million descendants in three years. Ponder councillor Gloria McCluskey’s off-handed jab: Rats are mean-looking creatures. Or is McCluskey’s comment more meaningful than it comes off at first blush? Doesn’t it illustrate that perhaps our greatest objection to rats is rooted in our cultural sense of them? Pest control boss John Zinck has thought about this, too. “If you go back through time---even if you look at drawings and artwork---the rats are the big mean guys who are coming to hurt humans. And that’s just a perception,” he says. I think that’s supposed to be reassuring. It is said that we hate in others the things we hate the most in ourselves. And this is no more true than it is in our disdain for our constant companion, the rat. And, after all, it could be worse. A short-tailed weasel showed up in a toilet bowl in the Truro area, the Museum of Natural History’s Andrew Hebda told me. Lezlie Lowe is a freelance writer living in Ratifax.